J LO JUST WORE THE CRAZIEST DRESS WE’VE EVER SEEN!! 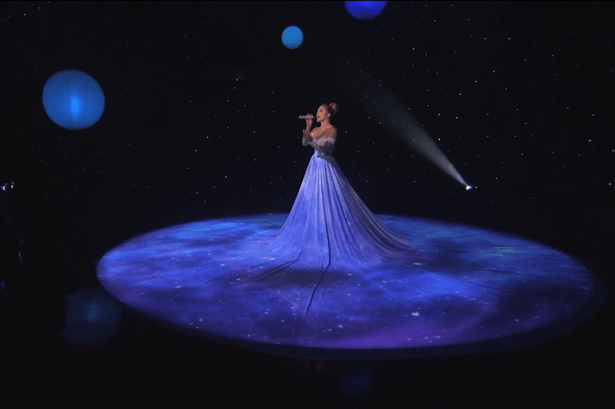 During Thursday’s American Idol episode, Jennifer Lopez performed the ballad, “Feel the Light,” from the animated film Home. But it wasn’t her vocal range that had everyone talking — it was her white gown with what felt like a never-ending circular train that practically took over the entire stage. Created by costume designer and J.Lo stylist Mariel Haenn. While she performed, special effects and images of the film’s animated characters were projected onstage and onto her extremely long skirt, making her almost blend in with the setting. Jennifer Lopez Wears Her Most Revealing Dress Yet for 46th Birthday Bash: Pictures, Details! Older PostWho will win Sunday’s El Clasico between Barcelona and Real Madrid?